The beautiful Amish Wilton Bench is handcrafted using solid oak wood, maple wood or cherry wood and finished in a wide variety of stains or paints. Our most popular finish is our painted black Windsor Bench. If you are looking for a true reproduction finish you might want to consider a barn red or green paint. The first Windsor Chairs in England were painted green. This Amish Wilton Bench brings to mind Early American furniture. 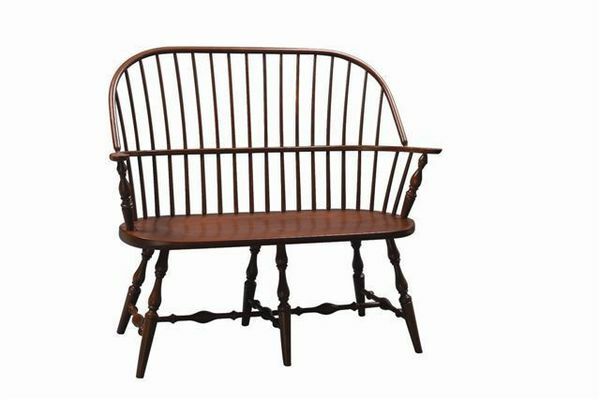 This is a reproduction Windsor Bench that resembles the ones from the early 1800s. The bow back on the Windsor Bench is steam bent, the legs are extended through the seat and a wedge soundly pounded into the end of the tenon to tighten the joint. This quality Old World craftsmanship makes a sturdy, solidly constructed Windsor Bench! Use this Amish Bench in your dining room around the table, in the foyer or bedroom. Wherever the solid wood Windsor Bench is placed it is sure to make an impression. Visit our store in Sarasota, Florida or call us at 1-866-272-6773 with questions or to order our Windsor Furniture.